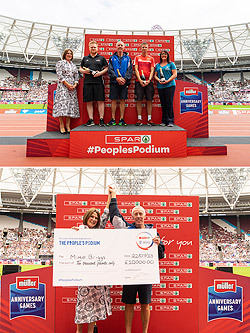 SPAR, the UK’s leading independent convenience group and partner of British Athletics, has named Mike Briggs, a gymnastics coach from Dumfries, Scotland, as the overall winner of its People’s Podium Campaign. The People’s Podium initiative recognises and rewards individuals supporting community sport across the UK. The UK-wide competition saw hundreds of people nominate individuals involved with incredible sporting projects in their region. SPAR rewarded four of the best candidates with £2,000, which will go towards supporting their sports projects. However, it was Mike Briggs, a gymnastics coach at the Dumfries Y Gymnastics Club, who was awarded the £10,000 grand prize. Briggs worked his way up the rankings, from volunteering at the club when his daughter started, to leading the club as Head Coach. SPAR recognised the incredible achievement Briggs had accomplished to take the Dumfries Y Gymnastics Club to different heights and how he intends to take it further. Mike Briggs was revealed as the winner of the £10,000 prize in a presentation that took place during the Muller Anniversary Games at the London Stadium. Briggs, and three of the other winners of the People’s Podium, were given the same treatment as the world class athletes, taking their place upon a physical ‘People’s Podium’ in the stadium, and receiving VIP treatment in SPAR’s hospitality boxes at the Games.